The water levels of the two non-tidal river systems on the west side of the Washes (the Counterdrain/Old Bedford, and the Old Bedford/Delph) and water within, or on, the Washes, are controlled (as far as possible) by the Environment Agency (EA) in accordance with a Water Level Management Plan (WLMP) as amended from time to time. The Plan sets out the objectives - flood defence, nature conservation, agriculture and recreation - and the management needed to try to balance and satisfy the different requirements of those activities. It contains guidelines, target water levels, and the operating rules for some of its water control structures - in particular, Earith Sluice (which controls the flow of water into the Old Bedford/Delph) and Welches Dam Pumping Station (which controls levels in the Counterdrain/Old Bedford) are operated in accordance with very precise water level figures. 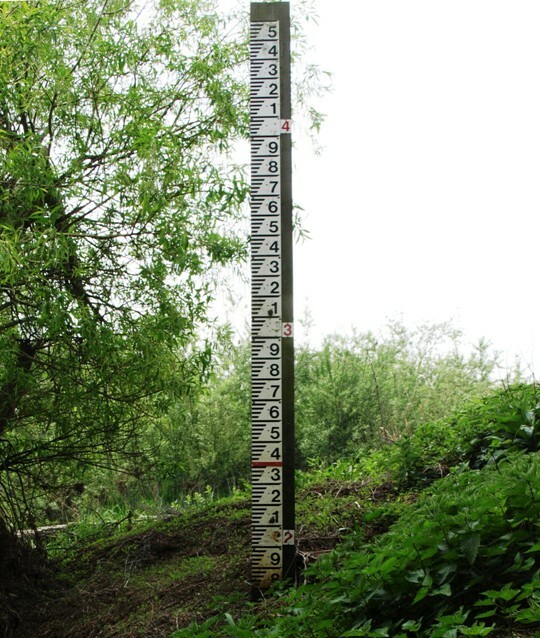 Water levels are measured against a reference or datum point known as Ordnance Datum (OD) set by the Ordnance Survey (OS) for measuring heights above "mean" (average) sea level. Levels above that are "AOD" - Above Ordnance Datum (the 'A' or 'Above' is commonly omitted). This is the same datum point used to indicate heights of land on maps. A difference of 1.3 or 1.6 ft would be unimportant in upland areas, but extremely important in the low-lying Washes. Also, the difference in the converted Earith and Denver figures, 0.3ft (3½ inches), may seem small but can be very significent in terms of operating the control structures. 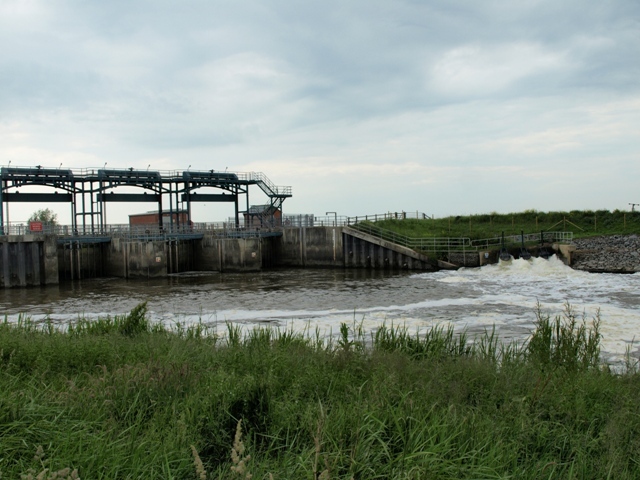 My choice of 13.9 ft for Liverpool was not random - it was the original "summer" drawmark level for opening the gates at Earith sluice as shown in the 1920 Act. That level is now set at 3.77m, so it does seem that the operating level has changed since 1920 despite the oft-quoted statement that it cannot be altered. It may have changed under the terms of the 1930 Act, but so far I have not been able to find any reference. In the South Level and Middle Level much of the land is below sea level (ordnance datum). To avoid negative values, measurements are shown against 'South Level Datum' (SLD) which is OD plus 100. A reading of 101.0 SLD = 1.0 AOD; and 98.8 SLD = minus 1.2 OD. Simple gauge boards made of plastic or alluminium with painted or embossed markings, affixed to a wooden back-board, can be seen at many places in the washes. Reading them can be tricky, but with care, readings can be made to the nearest centimetre. The figures relate to top of line below. The figure above each 9 indicates full metres, the other figures tenths of a metre. Top and bottom of short lines indicate hundreths. These two photos are the same board, in the Delph at Welney; the left view is typical of most boards with the full metre figure difficult to spot - here it is the 4 between the 1 and 9. This board was amended in 2009/2010 and is much easier to read with full metre figures shown in red and moved to the right to distinguish from the tenths. The main board at Welney. Note, water level does NOT indicate water depth. 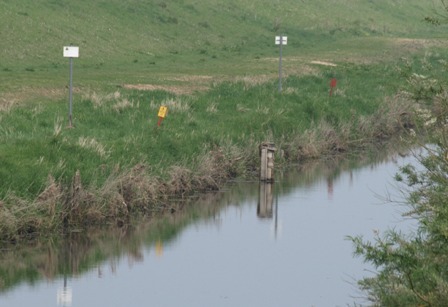 Also note that some bridges over navigable waterways have similar looking gauges fitted, but they show headroom under the bridge; again that is not an indication of depth. The only depth gauges I have seen in the Washes are on the verges of the Wash Road (A1101) at Welney, erected by Norfolk County Council. The local community website says they are very inaccurate; my own checks in 2011 revealed they under-read then by about 8" (20cm). Some readings are available on-line on the EA website; the Welney information is of particular interest to motorists using the A1101, but only for those who know how to interpret the figures, see below. In 1996 the EA had 7 'telemetry gauging sites' monitoring levels in the washes. These are shown below. Current situation unknown, but presumably improved & much extended? The EA publish many site figures on-line, updated frequently and very useful. Those affecting the Ouse Washes are shown below. Click place name/EA link to view the EA page giving current levels and those of previous 48 hours. Note, some measurements on EA webpages and copied below are relative to a local site datum, not to Ordnance Datum (OD). Add the site datum figure to the EA reading to convert to AOD, and note the times are GMT. Update, Feb 2016: The EA have "improved" their website and all original links below have changed. Ugh! bloody EA! I have now amended them (and added 2 sites the EA don't publish). If you had saved any in your favourites, you will also need to amend. 3.04 (4.93 AOD), 20/04/12 2.66? 1 Although a long way from the start of the washes, the flow	here can affect the operation of Denver Sluice, (and maybe Earith Sluice?). High river levels may suggest high flows, but I don't know of any way of relating these accurately. 2 The EA site name is confusing; the telemetry site location is as I've noted; the name really ought to apply only to the visual gauge boards immediately south of the the Delph Bridge, one of which shows when the "causeway" i.e the A1101 Welney Wash Road, will start to flood. From my observations, the gauge board and telemetry readings correspond. 4 figures(s) shown on EA website in 2011. Jan 2014 update. I have just found a private website giving all the EA's country-wide river level information in, dare I say this, a more attractive way. Information for the Welney Wash Road (which the EA insist on calling Welney Causeway) can be found at http://www.riverlevels.info/river-ouse-welney-welney-causeway . Do try it. Below are just a few of the many gauge boards in the Washes; I will add new sites in due course. I will also try to regularly record and display readings which influence the operation of sluices etc. 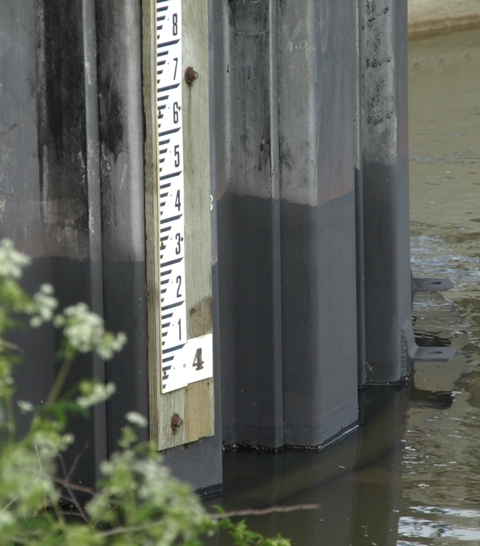 A problem for the public trying to understand the workings of structures, or monitor the EA's operation of them, is the difficulty reading some water level gauge boards. 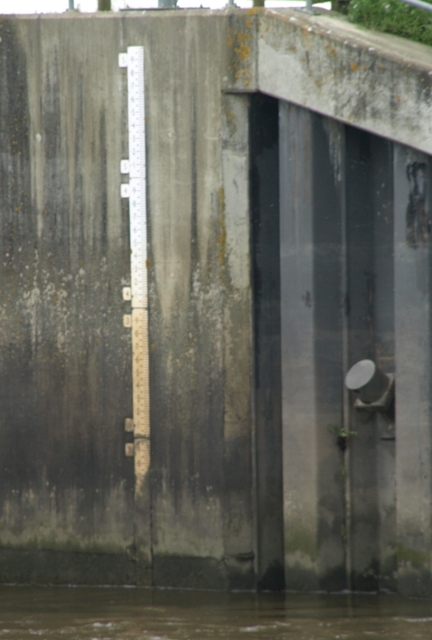 Gauge board at Earith Sluice on the upstream side (Bedford Ouse). Viewing involves trespass and fence-climbing. Lowest reading marked is 3.9m AOD. Welmore Lake Sluice downstream (Hundred Foot River) side, seen here from the Sth Level Barrier Bank. Unreadable even with long camera zoom lens. Whereas EA staff can see telemetric information from all around the area on their computers, we public may have to walk miles then sometimes find boards are illegible, broken, overgown or positioned out of the water so unable to judge whether structures are working (or soon likely to be) in accordance with the rules. See comments about datum points in page introduction. Gate Sluice OBR W upstream side of gate TL 5293 9384 ?-2.54 21/04/11 0.9 ? Gate Sluice OBR W downstream side of gate TL 5293 9384 ?-2.54 21/04/11 0.9 ? 1 OBR=Old Bedford River; NBR=New Bedford River (100 Ft River); DR=Delph River; CD=Counterdrain; WC=Well Creek; RGO=River Great Ouse. 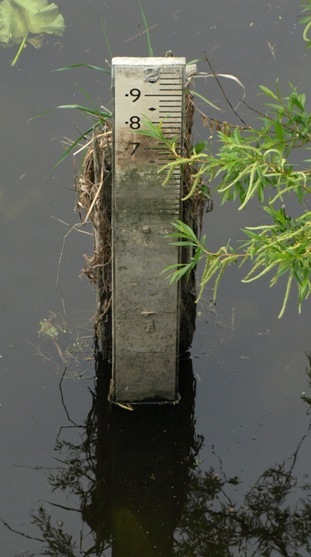 There are two boards in the west bank of the Delph River that can be read looking over the south side of the Delph Bridge. The main board is very tall, reading from 1.6 to 4.5m AOD, and can be seen at all times. A shorter one to the left reads up to 2m at which point it becomes submerged. Neither has any relevance to operation of control structures, but the taller one does indicate to those who know about it whether the A1101 Welney Wash Road is flooded, and if so, by how much. At some time in 2009 or early 2010 the EA improved the main board making it easier to read (as described above). A red line was also added at 2.40m to indicate the level when floodwater begins to flow over the road, although there's no sign to say that, and the boards are not visible from the road anyway. However, it does enable those who know about this to calculate road flood depth by deducting that figure (2.40) from any higher indicated level. It's a shame the EA do not mention this on their otherwise helpful web-page showing regularly updated Welney causeway telemetric levels readings. When the road is flooded, even by only an inch, barrier gates are put across the road (well, across half the road) at each end (ie, Welney village and Suspension Bridge). Many believe it should be left to individuals to judge whether it is safe to cross, and not to apply a blanket rule to all whether driving a low slung car or a high clearance tractor. The Great Ouse (including sections known by other names, i.e. Tidal River, New Bedford River or Hundred Foot River/Drain and Bedford Ouse) is tidal up to Brownshill Staunch. High tides flowing upriver can act as a "dam" blocking fluvial flows (water from upstream). A combination of high Spring tides or wind driven ones meeting unusually high flows (from heavy rain or melting snow) coming down can lead to flooding of the Washes, either as a result of Earith Sluice opening or the western bank (the 'cradge' bank) of the New Bedford River being "over-topped". The tide tables for Kings Lynn are available on-line (click 'Kings Lynn Tide Times' in grey box on left), but only for about 7 days. Beware, the datum points are different to Ordnance Datum for land elevation.